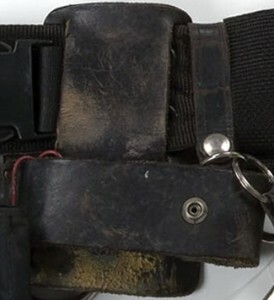 A black leather tape measure holder houses the Belt Gizmo; the top and bottom slats have been removed to accommodate the circuit board, which appears to be simply wedged into place. In Ghostbusters II, the Belt Gizmos are carried in slightly different tape measure holders, sporting a noticeably thinner band across the middle. 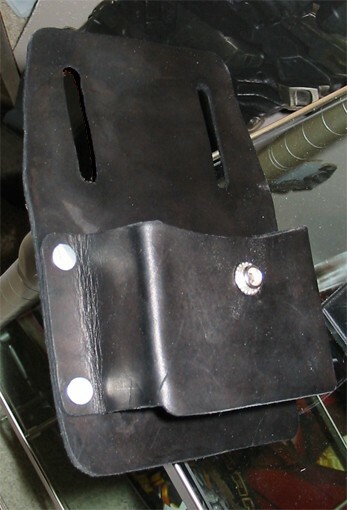 The tape measure holder can be worn with the belt under or over the middle slat (as seen in GB1). 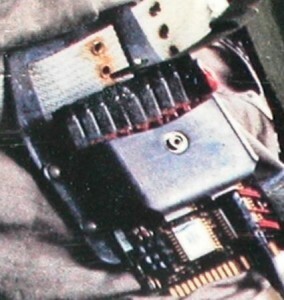 However, in GB2, they are only worn with the belt under the middle slat. In Ghostbusters: The Video Game, they are once again worn with the belt over the middle. This replica tape measure holder greatly resembles the ones used during the NYC shooting. Note the curve along the top and lip along the bottom of the middle band.